Toronto Registration – Now Open! Iyanden Supplement – Already Sold Out! It has been less than a week since GW released the Iyanden Supplement (webstore only) release. It is already sold out in North America and will need to be restocked before people will be able to order it once again. This can be viewed as a good thing, for GW, as the demand for these supplements appears to have been greater than initial projections – or perhaps it is more likely the case that GW has limited the availability of these products to generate a false sense of demand. If it is in fact the former, then we can expect to see more of these sorts of releases. The fact that these are Direct Services only releases which actually contain playable army lists and rules is a bit troublesome when you consider that up until now all core rules have been available for purchase at GW retail stores as well as independent retailers. Combined with a price-point that is the same as a full codex, it this leads to some questions about the way GW is handling this line of business and how this will project into future releases. This on the heels of GW’s latest Iyanden “One Click” Ghost Warrior collection offer. Interesting to note that the Iyanden Supplement isn’t included! New Codices – How will they fare at Astronomi-con? Starting with this summer’s Astronomi-con Toronto three codices will be making their Astronomi-con debut. Codex: Tau Empire, Codex Eldar, and the Iyanden supplement for Codex: Eldar will all be available for players to select. Will these codices have a big splash at Astronomi-con this year? 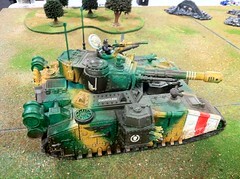 What kind of army lists will we see at 1500 points? Astronomi-con promotes a balanced army approach to army selection, formally with its Composition scoring and more subtly with the widely diverse scenarios. With a 1500 point limit, generals are challenged to get even more out of their selections. We are looking forward to seeing what kind of impact these new codices will have on Astronomi-con as a whole as well. 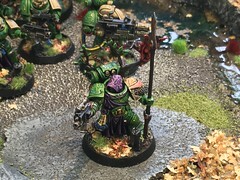 What are your thoughts on these codices entering the Astronomi-con tournament setting? The Eldar have finally arrived, and how they work on and off the tabletop has changed significantly. With BS4 across the board, they have reclaimed some ground in the rankings of shooting armies. Where they really stand out is in their ability to maneuver. 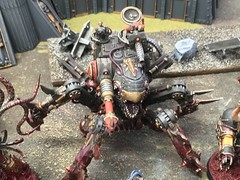 When you really think about the game, the only things you can really control on the table, is how you move your models. Pretty-much everything else that happens on the table is influenced by the roll of the dice. I’ll discuss things you can control off of the table later on. 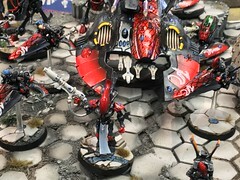 Their new Battle Focus rule gives the Eldar player even more movement options. The ability to shoot then run, or run then shoot is subtle, but can have a big impact on the flow of the game. 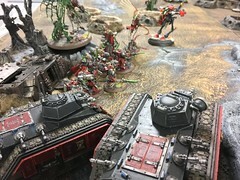 Bringing Eldar units into weapons range, or moving units away from the enemy to put more distance between potential assaulters can really confound an opponent. 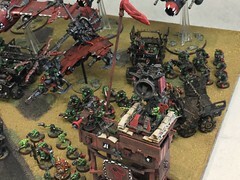 In their old codex, Warp Spiders and Eldar Jetbikes used to be the only Eldar units that could do something similar. This ability to maneuver gives the army something unique. How players will incorporate this into their tactics will likely make the difference between an average Eldar general and a great one. Their signature shuriken weapons, have undergone a significant change, with to-wound rolls of 6 automatically causing a wound at AP2. This ability combined with the BS4 makes units like Guardians especially deadly when they get into range. 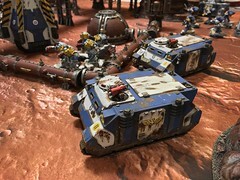 Combined Battle Focus, these units can threaten any non-vehicle unit. Two new flyers have been added to the army, each with some interesting tactical options and roles. While relatively fragile in armour, their vector dancer ability will help ensure they remain on the battlefield to influence the course of the battle. The codex also puts an emphasis on the role of Wraithguard, Wraithlords and the new Wraithknight in the way the Eldar wage war. These units all combine high toughness and a good armour save and Fearless. 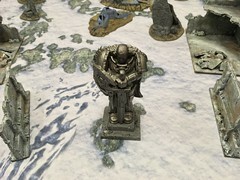 Supported by new plastics for Wraithguard, and the towering Wraithknight these units are sure to be a common sight on the game table. The Eldar have always had an emphasis on their Psykers and this codex does a decent job of keeping the Eldar in the conversation. The new Spirit Seer is a nice addition, essentially a mid-range psyker that makes Wraithguard units Troop selections. Farseers now get Mastery level 3, (up from 2); Spirit Seers get Mastery level 2, and Warlocks have Mastery Level 1. Note that now Warlocks must cast their powers to manifest them. The notion of ‘Always on’ psychic powers has now truly been abolished. This is definitely a blow to the fundamental way Warlocks have worked in the past. Perhaps the biggest change for psykers in v6 is the way psychic powers are generated. The Eldar have now also gone down this path, with random Eldar specific powers available for Farseers (Runes of Fate) and Spirit Seers & Warlocks (Runes of Battle). This is a major change to the pre-selected powers Eldar players have enjoyed since third edition. The ability to select powers was at the core of those Eldar builds which made use of psykers. It shaped their tactics, army selection, and permeated the entire battle. This may well be the biggest adjustment Eldar players will face with this new codex. It isn’t all doom and gloom however, as each of these disciplines have Primaris powers. Guide for Runes of Fate, and Conceal/Reveal for Runes of Battle. Farseers and Spirit Seers gain access to the Telepathy discipline, while the Farseers also can select from Divination. All of these psykers come from the HQ part of the Force Org chart. Thankfully, Warlocks do not take up a force organization slot. Some of the things you can control off of the table, are the design of your army, including selecting your wargear and at least to some degree psychic powers. When designing any army, how units work together is always something I take into account. With the Eldar, this principal has always been a big part of their success. With their very specialized nature having units working together brought all kinds of benefits. 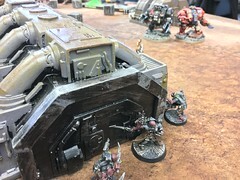 With their increased ability to maneuver thanks to Battle Focus, their ability to concentrate force on a particular point on the battlefield, or to react to changing circumstances is very helpful. 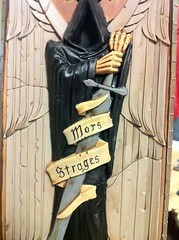 Their Psykers can still play a key role in supporting the fighting units of the Eldar. For Wraith armies, the Spirit Seer is essential. For more conventional builds, Farseers and Warlocks still can be put to good use. The powers that get generated and the decision to stick with them or revert to the Primaris powers will greatly influence how these psykers are deployed on the battlefield, but they are certainly a more variable factor than seen previously. This will likely be the most difficult thing to overcome for veteran Eldar players. Maneuver is now the central focus of the Eldar, not the rock-solid Psychic foundation of the past. The variable nature of their psykers can be mitigated somewhat by committing more points to add additional psykers. While this still won’t guarantee getting that specific power a strategy relies on to work, players will still have a better chance to have the desired power come up. Turning this seemingly negative into a positive, this does allow the Eldar player to have some new control over what powers and disciplines they draw from based on their opponent’s army and the scenario being played. How the Eldar fare in the future is yet to be seen.